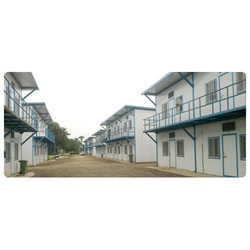 We are one of the profound manufacturer and supplier of Low Cost Housing. These are innovative, affordable and attractive solution for urgent housing need. We have a great production and project execution capability and thus we have capability to serve various government and CSR activities. Due to their specific features such as high space, negligible maintenance and easy installation our offered products are widely demanded by the clients. Further, we offer these products to the client at competitive prices. Being committed towards ensuring complete client satisfaction, we are offering a durable range of Low Cost Housing structure. Widely demanded in residential, commercial and construction sites, this is fabricated in compliance with set quality standards using premium grade materials and modern methodology. Apart from that, this is acknowledged among our clients for its high space, negligible maintenance and easy installation.